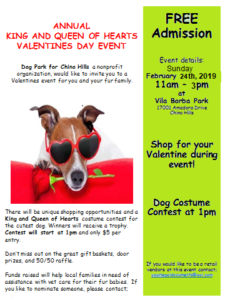 Dogs in Costumes, Trophies, Raffles, Music, Fun, in a Valentine theme for our furry pets! Calling all local businesses, home businesses, and/or services! We are offering you the opportunity to set up a booth at our annual King and Queen of Hearts Event Feb. 24, 2018 from 11 am to 300 pm! Contact Loretta Szudy at lorettaszudy@gmail.com for an application.